Missouri Livable Streets works to increase access to safe transportation for all users and to create healthy, economically strong communities. Stories, periodic updates and more from partners around the Show-Me state. This article was originally published on page A5 of the Monday, September 27, 2010 edition of The Columbia Daily Tribune. For 40 years transportation officials unwittingly hurt the national security, health and economic vitality of the United States by worrying more about how to move cars instead of people. Entire cities were constructed without sidewalks, trails or bicycle lanes. At the time, it didn’t seem to matter because no one could imagine the energy, environmental and obesity crises of the future. Today, as people start to awaken and look for alternatives to the automobile, they realize — even for the shortest trips — that they are trapped by the poor designs and shortsighted policies of the past. Now there is a better way, and it’s called “Complete Streets.” This term describes a way of designing roads so that they are accessible and comfortable for everyone, not just automobile drivers. Engineers consider the needs of bicyclists, pedestrians, wheelchair users and transit riders while designing new roads. Complete Streets have additional features that a typical street might not. Things like sidewalks, well-designed crosswalks, bicycle lanes and narrower automobile lanes to control speed are all common parts of a complete street. Complete Streets enhance safety, improve accessibility and give people a choice in what mode of transportation they want to use. People can certainly drive an automobile, but they can also bike or walk if they choose. Those are choices that most Americans feel they do not currently have because of the way our roads have been designed in the past. Seems like pretty sensible transportation planning, right? Unfortunately, this concept is new to many communities. Columbia was actually the first Missouri city to have a policy like this. The new standards were passed in 2004, and they called for widened sidewalks, narrowed auto lanes in residential areas to lower speeds and that some type of bicycle facility would be built. The standards did not fix decades of poor design, and they are not perfect, but they ensure that new roads will be built with non-motorized users in mind. Although these policies seem like common sense today, they took four years to pass and several community members expressed concerns. Since then, Complete Streets policies have become more mainstream and much easier to pass. I’m convinced that in the next decade people’s views about transportation will continue to evolve. Bicyclists, pedestrians and wheelchair users will continue to get a larger slice of funding at every level of government, and we will have complete streets policies at both the state and federal level. With this increase in non-motorized infrastructure, people will once again be able to do things that we used to take for granted in this country. Things like allowing their children to bicycle to school without fear, walk to their next doctor’s appointment or any of the other activities that they feel like they cannot do, thanks to some shortsighted policies of the past. Reach Robert Johnson at 573-289-6479 or e-mail robert@pednet.org. Copyright 2010 Columbia Tribune. All rights reserved. This material may not be published, broadcast, rewritten or redistributed. Who doesn’t like ice cream? The thing about ice cream is that everyone likes it, but for different reasons. Some like it in a sugar cone while others prefer it in a dish. Chocolate lovers might like it with a big dollop of hot fudge while purists don’t want anything to get between them and their vanilla bean. Well, biking is the same way. You might love to bike alone. You might love biking with a spouse, your friends or your children. You might be into racing, complete with a riding suit. Or, you might prefer a quiet ride while you roll through the countryside on a warm, summer evening. Whatever your personal preferences are, you stand to benefit from using the pedals on your bike instead of the ones in your car. One of those benefits is a fatter wallet. You might think that the only people who make money on their bicycle are those who ride in the Tour de France or Ironman competitions. You would be wrong. Although it might not seem like much, every time you decide to bike to work, to the store, or to a friend’s house you save money by leaving your car parked. Whenever you choose to spend an evening on a bike ride instead of driving to the mall or the movies, you save gas money, maybe enough to afford that tub of movie-theater popcorn. 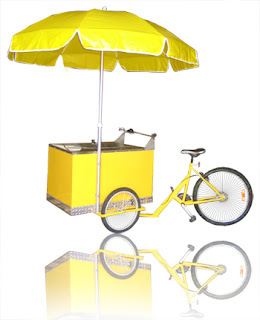 Biking has other cost-saving aspects that might not initially come to mind. Rather than pay $60 a month for a gym membership, burn calories by going for an evening ride a couple times during the week and a couple of times on the weekend. Neighborhood or community riding groups are a great idea, too, to build your confidence and social network. You can even get out a map of your area and mark off the places you’ve explored. MapMyRide.com has great, free tools to help keep track of where you’ve gone and where you’d like to go. It also has a way to see where other people in your area like to ride. Make it fun and give yourself a goal to have the map filled by summer’s end. No, riding your bike probably won’t make you rich, but it can put a little money in your pocket, and it definitely can be a great way to create quality time for yourself or with others. I don’t know if I would go so far as to say that it’s better than a bowl of mint chocolate, but bicycling does have ice cream beat on at least one thing - While I can’t squeeze more than a triple-scoop cone in my stomach, I can never get too much time on my bike.By Kurt Woock. On my ride in to work this morning I was given a crazy wave. If you bike or walk anywhere you know this particular gesture. I approached an intersection near the University of Missouri campus at the same time as two cars. One approached from the cross-street, the other from the opposite direction. We all stopped. Yes, as a bicyclist I stop at intersections, too. After a few extra seconds of everyone being polite and waiting the cross-street driver turned right. The driver who remained wanted to turn left. I wanted to continue straight. Someone must go and the other must wait. Clearly a generous man, the driver waited for me to advance on my bike. Also being a man with limits to his patience the driver needed to gesture to me that he wanted me to make my move first. To communicate that wish to me, he waved. He waved frantically. He gave not a casual wave as if to say "You go ahead, my fellow traveler" rather he offered a jerk of his hand. Then he did it some more. Raised from the steering wheel, his hand flapped at me with quick stabbing motions. Hurry up and go already! So I did. I gave him a nod of thanks as I passed and I could only see enough of him to know that he was a he. When most commuters make most trips by personal automobile the quality of human interactions in the public realm declines. As walkers and bicyclists we are out in the world. We see the sky and feel the wind and we see everyone else at a low miles-per-hour pace. I may be bundled up and in a hurry, but I still can make eye contact with my fellow commuters, strollers and loose dogs. Sealed up in our Ford Ranger I would not be able to make eye contact as easily with others on the road no matter their travel mode. As a driver if I absolutely have to communicate something to another person outside of my sphere-on-wheels I will, of course, wave frantically. Hurry up and go already! I could roll down my window and nod possibly making eye contact with another commuter, but that might cause me to spill my Starbucks, which I would keep safely tucked between my thighs taking drags off the plastic lid at every red light. But I digress. Livable streets encourage walking and bicycling. A network of city streets featuring bicycle lanes, sidewalks and crosswalks aren’t intended to make it hard to drive places. Rather a livable street should make it easy to make eye contact with other commuters. And that keeps things safe for everyone. I recently heard a State official here in Missouri explain that busses remain the safest way to move students to and from school. (Less cars = less road accidents. That makes sense.) And when the kids exit their bus and prepare to cross their street, they have been schooled by the bus driver and their teachers to be 100% sure they make eye contact with the oncoming driver. Only once eye contact is established can the student know for sure that the driver saw her. Now she can safely begin to cross the street on the way to her home. The driver could also acknowledge that he saw the student preparing to cross to her house by flapping at her with one of those crazy hands. Livable streets must be born at the local level. For example, parents – concerned about their students safety – can request to the school principal and superintendant that sidewalks be installed near school. Senior citizens who want to walk to a nearby grocery store can ask their City Councilwoman to introduce a livable streets ordinance to the council for consideration. Such a policy leads to more infrastructure that encourages active transportation for all. A local livable streets policy is a statement of values in the city code that says we will consider the needs of all residents when building new streets and reconstructing existing roadways. All residents means all residents. Not just those who operate a personal vehicle. Over time, a local livable streets policy can guide city and state staff to creates street designs that meet the needs of users of local streets regardless of age or ability. 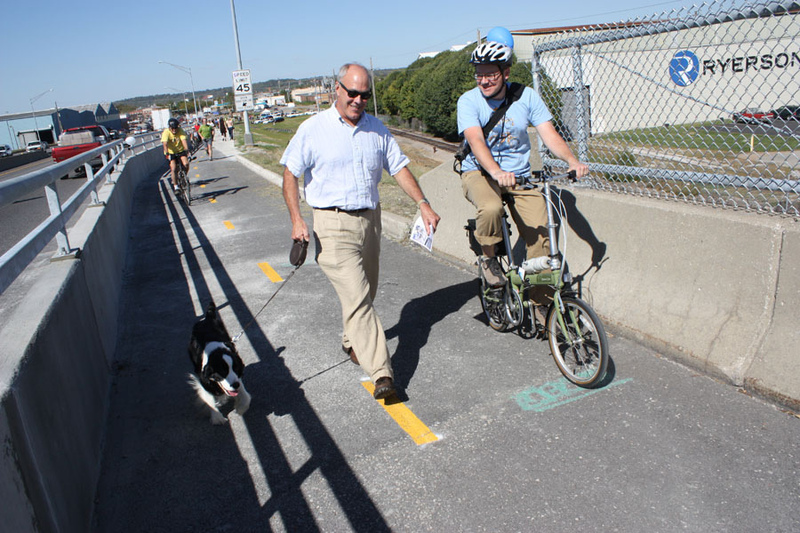 Missouri Livable Streets works to ensure that communities have flexible policies in place so all Missourians have access to safe transportation options, regardless of ability, age or income level. Missouri Livable Streets is a project of the Missouri Council for Activity and Nutrition (MOCAN) and maintains a statewide advisory committee supported by the University of Missouri Extension, Missouri Department of Transportation, Missouri Department of Health and Senior Services and other public-private organizations. Learn more at http://livablestreets.missouri.edu.